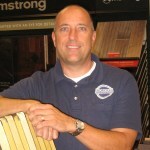 "Happy Customers Are Our Biggest Source of Referrals"
Tony Workman is the President and CEO of Workman Flooring. With over to 17 years of industry experience, Tony has spent years learning how to make sure his Utah area customers receive the highest quality Hardwood Flooring installations through working with the best suppliers and using skilled installers. Tony also strives to provide you with the best customer service experience so that your job runs smoothly and on schedule. A seasoned expert, Tony has extensive knowledge of the mechanics of installation, and can accommodate and resolve problematic installation issues. Licensed in business since 2002, he has worked steadily with local architects, general contractors, designers, flooring shops, property management and homeowners bringing the beauty of carpet, hardwood floors and other flooring products to many of Utah’s finest homes and businesses. Not only does workman provide the highest quality wood, carpet and Vinyl materials, Our Hardwood installers are the finest in the valley, they pride themselves on being professional, prompt, clean and knowledgeable with their trade.